In the autumn of 1898, Casa Vicens was the scene of an unfortunate incident that was documented by newspapers such as La Publicidad, La Vanguardia, La Campana de Gràcia and others. We can also seek out additional information and inquire into how the neighbours perceived the building, for example. When conducting historical research, direct sources provide the most relevant information, but you can also make use of other resources that may seem anecdotal, but which can enrich the investigation and provide interesting additional information. The incident was the death of Ramona Domènech i Tarragó, just a few months old, who accidentally drowned in the garden waterfall, which has since been removed. 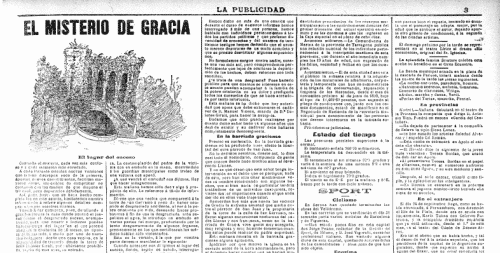 The 26 October 1898 issue of La Publicidad describes the property owned by Dolores Giralt, the widow of Manuel Vicens i Montaner. The article mentions the original style of the building, “a mixture of all the architectures that distinguishes it from the other buildings”, and describes it as a house “almost surrounded by gardens, deserted for several years”. This last fact is important. As the newspaper explains, Mrs Giralt, Manuel Vicens’ widow, stopped living in the house after he died and went to live in the house of the rector of the church of Sant Joan de Gràcia, Francisco Llanas Viñas. In fact, in his will, Manuel Vicens appointed Francisco Llanas to be the legal guardian of his adopted daughter in addition to the sculptor Antoni Riba, who created both sculptures conserved in the dining room at the Casa Vicens. If we continue reading, we realise that almost all the news articles describe what the garden and the waterfall were like: a “tall, slender, beautiful construction, almost hidden by ivy, which makes the lines of its architecture disappear”, according to La Publicidad. The article published by La Campana de Gràcia is illustrated with a photograph of Casa Vicens, specifically the southeastern façade of Carrer de les Carolines. This photo is very interesting, since it is one of the few that remain of the original construction designed by Antoni Gaudí. In fact, this image, along with two others held in the Photo Archive of the Centre Excursionista de Catalunya, has been essential for tackling and promoting the project to restore and renovate the house. Finally, another newspaper shows us a scheme of the structure of the house identifying how the different spaces were used.